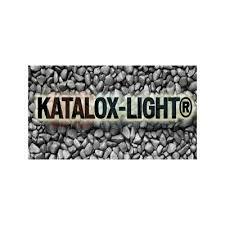 Katalox Light is a popular, relatively new filter medium that is used in backwashing filters for treatment of iron, manganese, hydrogen sulfide odor and even more exotic contaminants like arsenic. We’ve found Katalox to be a mixed blessing. As a natural Zeolite-based iron/manganese/ hydrogen sulfide treatment, Katalox has the great advantage of being light enough to backwash easily (as compared with Filox). It also supports a generous service flow rate (as compared with Birm), and it works well with most standard oxidizers. Because of its low density and high service flow capability it fills a gap between the high and low performance iron reduction media. Our experience has been that in most cases Katalox raises pH, sometimes to extremes, and increases alkalinity. These are temporary issues that eventually go away without treatment. Katalox can also put out a fine sediment that leaves a thin film on dishes and fixtures. About 5% of our residential customers complain of an alkaline taste and musty odor. These issues also go away with time, but they can try your patience. Upon installation, Katalox should always get an overnight soak before the filter is put into service, plus prolonged backwashing to clear out fine sediment. The long backwash can help eliminate adverse side effects like bad taste, odor, and sediment, but it does not guarantee that they won’t occur. Although Katalox clearly has some problems, we keep selling it because it’s worth the risk of experiencing some of the inconveniences described above. It allows sizing filters much smaller than would be needed with media like Birm, and it requires less frequent backwash than heavy media like Filox.